At first glance 1976’s The Town That Dreaded Sundown neatly fills the ‘mysterious masked killer’ gap in between 1974’s Black Christmas and 1978’s Halloween in the slasher genre. 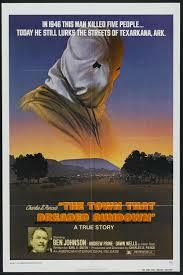 However there is some debate to be had whether The Town That Dreaded Sundown is a slasher film or not. I’ve seen folks refer to it more of crime drama, or a mystery. Maybe these people don’t like the slasher label, and feel it demeans the film in some way? It certainly has many of the hallmarks; the aforementioned masked killer, pretty young victims, bumbling cops, inventive deaths, a tension filled chase through the woods, spiky musical score and so on. It also has the genuinely unsettling fact that it is based on a true crime that was never solved. And not in the sense that The Texas Chain Saw Massacre was very loosely based on the crimes of Ed Gein. In 1946 the town of Texarkana was terrified by a series of five murders, of mostly young lovers, who were killed by a hooded man who became known as the Phantom Killer. He was never caught. That isn’t to say that the film changed nothing of the original case, and the fact that at the beginning the film states that ‘only names have been changed’ is clearly untrue (death by trombone is far too ridiculous to have actually happened for a start. Yeah, there’s a death by actual trombone in the film). But the fact that the base story here was reality for the residents of Texarkana, and not really that long ago either, is fairly chilling, with a veneer of exploitation on behalf of the film makers – Although seeing as Texarkana townsfolk appeared in the film as extras, they didn’t see it as malicious intent on behalf on the film makers to exploit their suffering. The cops who investigated the real case however, have more cause to be annoyed by their portrayal in the film. We’ll get to that later, let’s look at the film itself first. The film is presented in a semi documentary format, with Vern Stierman as the narrator, which I found slightly jarring at first, until I got used to it, it put me in mind of one of those Disney live action documentaries from the 1960s. But with more death. A young couple, parked in a local ‘lovers lane’, have their make-out session interrupted by a man wearing a hood over his face (I would be quite frankly, staggered, if the makers of Friday 13th Part 2 didn’t take inspiration from the Phantom Killer for Jason’s look in that film). He pulls the boy out the car and then attacks the girl, although the both survive the attack, and the police are on immediate alert, warning the town to stay away from lover’s lanes and other secluded spots. The next couple to be attacked are not so lucky and are both shot to death by the killer. 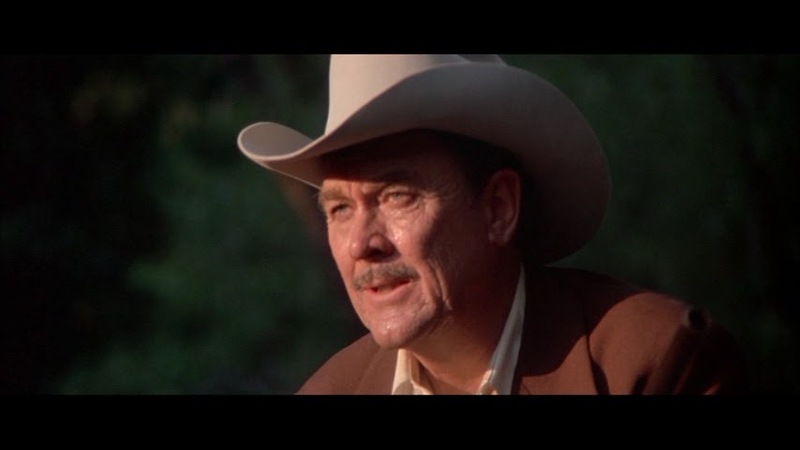 Deputy Ramsey (Andrew Prine) saw the Phantom Killer make his escape by car (no magical serial killer powers of instant transportation for him), but couldn’t catch up to the killer. Frustrated by their lack of progress in the case, the police call in Captain Morales (Ben Johnson), a renown criminal investigator. The town is curfewed and the residents don’t feel safe in their own homes. After a local high school dance, Morales sets up cross dressing policeman as decoys, hoping to draw the killer out (are we sure he’s a famous crime buster? It’s a ploy worthy of Chief Wiggum). His plan doesn’t work and two more people are killed; one shot and the girl tied to a tree and stabbed to death when the killer attaches a knife to a trombone and ‘plays’ it, in a scene just a little to silly to be scary, which is a shame, as it is preceded by a great chase sequence as the girl runs through the woods trying to escape the killer. Morales is disheartened by the latest killings, and the police are kept busy dealing with the idiocy inside their own station (‘comedy’ cops – just say no, slasher films) and the town’s locals, who are lining up to either dob their neighbours in as the Phantom Killer, or to demand greater protection from the cops. One red herring and slightly stupid chase sequence later, Helen Reed (Dawn Wells) makes her way home, followed by the killer. At her house, the killer shoots her husband and then Helen, although she manages to get away to the safety of a neighbour’s house, and his gun, which the killer flees upon seeing (he had abandoned his gun in favour of a pick axe at this point). When Ramsey and Morales receive a phone call about an abandoned car that matches the description of the car that Ramsey saw on the night of the first murders they race to the scene. They find the car and venture into the woods to search for him, eventually tracking him down and the final chase ensues. At a railway track the Phantom Killer manges to jump over the track just before the world’s longest goods train hurtles past. The cops shoot at the killer from under the train, wounding him in the leg in a totally out-of-place Peckinpah style slow motion shot which I found a little bit hilarious, not going to lie. The Phantom Killer limps off (after taking a shot-gun shot to the knee I might add), and is never seen again. The killings stop, but the murderer was never caught, and the film ends as the narrator intones; “Texarkana today still looks pretty much the same. And if you should ask people on the street what they believe happened to the Phantom Killer, most would say that he is still living here… and is walking free”. Written down like that the film seems to be the typical paper-thin plot of a slasher film. And the actual plot, once you take away the ‘real life’ aspect of it, is fairly transparent. And like other slasher films, it has some impressive set pieces, with the chase of the girl through the woods being particularly tense, amped up by the fact there was no music score playing so all you could hear were her frantic breathing and the sounds of the Phantom Killer closing in on her. It was a shame it cumulated in her death by musical instrument, which drained the suspense out of the scene for me, I thought it was a bit silly. Further silliness abounded in the police station, where the police, with the exception of Ramsey and Morales were basically portrayed as bumbling oafs. The most irritating of which was Patrolman Benson, played by Charles Pierce, also the film’s director, who was painfully unfunny, highlighted (lowlighted?) in the scene where the character couldn’t find his car keys, which I estimated that lasted about 2 days. He should have stayed behind the camera, where he does do a decent job. The cross dressing ‘hilarity’ (Some Like It Not?) was greeted with a stony faced weariness from me, it was very Benny Hill and just jarred too much with the scenes featuring the Phantom Killer. I didn’t find bumbling comedy cops funny in Last House On The Left, and I don’t find them funny here. It’s like the film wanted these two aspects (horror and comedy) featured equally but they didn’t gel well together. And then they try to add in a third aspect, Dukes of Hazzard Good Ol’ Boy style – Wacky car chases (including one car plunging into a lake, more side-splitting humour there) and the like. This isn’t to say I didn’t enjoy or recommend the film, I liked it a lot, just not all of the sums that added up to its parts. If this film was played straight, or toned down the comedy, or at least made it actually funny, it could have been a genuinely scary reconstruction of a shocking event. So it is a slasher film? Despite it’s best attempts not to be (I enjoyed the documentary style, and thought the narration was well done), I would say it is closer to being a slasher than it is a crime drama, and very definitely closer to being a slasher than a comedy. It may not be a slasher as the term is now defined thanks to the Halloween and Friday 13th films, but it has enough elements (and originated a few) to qualify in my opinion. The Town That Dreaded Sundown, slasher or no, has certainly influenced enough of the films that followed in the 1970s and 1980s to have its legacy assured in the slasher cannon, whether it wants to or not. This entry was posted in Uncategorized and tagged 70s Exploitation, Film, Horror, slasher, The Town That Dreaded Sundown by jelliclezombi. Bookmark the permalink.